Exercise for the American reader: Russian Federal Subjects; Chinese Provinces; German Länder; Canadian Provinces; …. Hey, I wouldn't want to try to identify most of the counties in New York State, and I lived and went to school there for my first two decades. Native to the USA (and often challenged to remember every single one of my country's states, forget counties), I have recently been trying to exercise my brain by memorizing the Historic Counties of England. It's been a long slog, but I think I am almost to the point where I could identify them all on a map. Why there are both a Hertfordshire and a Herefordshire, I don't know…. probably just to trip me up. But France…. if it weren't for wine and Normandy, I don't think I could even crack 10%! 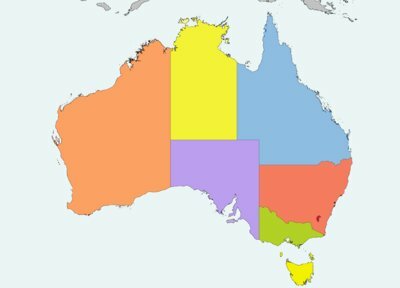 The Ozzie was right to be uncertain about six or seven Australian states: there are seven divisions on the Australia map, but one of them is not a state. Can you guess which one? I traveled around Europe many years ago and encountered many people who thought they knew all about American culture and geography. So I'd challenge them to name American states as they could. Typically, the list would go something like "New York, California, Mississippi, Alabama, Texas,… Chicago?" I think "roadkill wolf" could catch on. Or at least should catch on. I'm Canadian and could competently handle our provinces, your states, and the autonomous communities of Spain. Those are all places I've spent significant time. I thought I would do much better at Australia's map until I tried. I scored 3/7. I can say that I at least recognized the names of most of the regions of France, although I could probably generally locate only a handful at best. It depends on the state. For example, in Louisiana, parishes (which are their equivalent of counties) are fairly important political entities–more so than cities or towns for the most part. In general though, you're right. I'm an American with two degrees in social sciences from expensive, prestigious schools, and yet if you put a gun to my head and told me to identify all 50 states my brains would be on the floor somewhere around Vermont, New Hampshire, and Delaware. I wish I could pat myself on the back because I can label all the states in the US, China, and France, but honestly, who has the time to memorize this stuff? It's useless knowledge, akin to knowing a movie star's filmography, or the lyrics to all the songs from your favorite band. I came to the US (NJ) at the end of 4th grade, so missed the state identification/capital memorization stuff in school. I can reliably identify all of the east and west coasts on a map, plus Alaska, Hawaii, Texas, Oklahoma, Nevada, Pennsylvania, Ohio, West Virginia Minnesota, and Wisconsin. I can also do every county in NJ (except Cumberland and Salem, I keep confusing those), Delaware, and Connecticut, plus all the ones in PA and New York that border the states listed above, plus most that border those. For reference, I've only ever lived and worked in NJ (in 4 different counties), and alsp went to school in Pennsylvania (in 2 different counties). Un malpaso, I think Herefordshire vs Hertfordshire is still better than Shanxi vs Shaanxi. I meant to add that it's still fun to try and I enjoy reading posts like this. It's just that you'll often see local news media reporting on how American students are so dumb because we don't know basic fact X, when there's no real practical application for knowing it. It get's a little silly sometimes. "I traveled around Europe many years ago and encountered many people who thought they knew all about American culture and geography. So I'd challenge them to name American states as they could. Typically, the list would go something like "New York, California, Mississippi, Alabama, Texas,… Chicago?"" I traveled around America many years ago, and met many people who thought "Europe" is a country, and certainly couldn't name any actual countries. I really don't see your point here, other than maybe "America is important, Europeans are stupid, U-S-A". Has it occurred to you that perhaps there is no reason for Europeans to memorize American states, which are not even proper countries? There are actually 8 regions on that Australian map. Two are not states. One of the not-states is very small. … and it turns out there's another non-state in mainland Australia that I didn't even know about. It's so small it wouldn't show up on the map even if they tried to mark it. People always forget about Jervis Bay. Is it even well-known in Australia? My only question is, why did you single out Corsica? 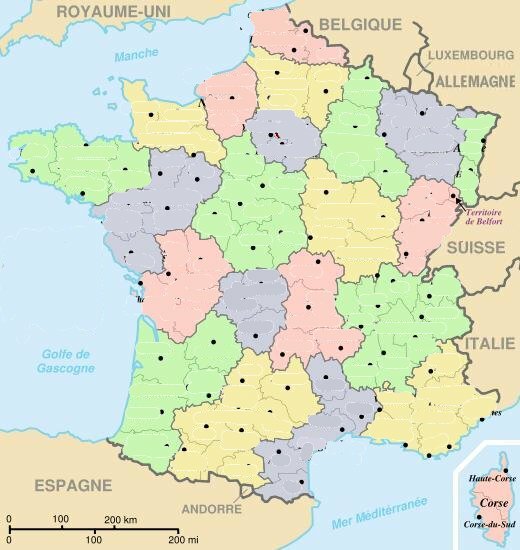 Do you support separatists and think that people memorizing French regions should leave C. alone? Anyways, the guy knows Texas, Hawaii, Florida, and Alaska. Wow! I didn't grow up in New York but am raising my kids here and they have definitely not been required to learn all the counties, although I think in 4th grade in our district the kids are required to memorize the names of all six members of the Iroquois Confederacy (not sure about locating their historical territories on the map, however). I grew up in Delaware where I can't specifically recall whether or not we were taught the counties in school but as there are only three I think most people successfully picked them up by osmosis somewhere during K-12. I do think we were taught the Canadian provinces in 6th grade as part of a "Our North American Neighbors" unit (although I had probably picked them up independently before then), but definitely not the Mexican states (although perhaps if Mexico had had a smaller number of subdivisions on the map than Canada did, it would have gone the other way around). It is likewise possible (memory hazy about whether I picked this up in class or independently) we were taught the Laender of pre-unification West Germany in 9th or 10th grade, but that would have only been for the minority of students who had signed up to take German. We definitely didn't learn the Swiss cantons, which would have been cooler imho. A surprisingly unhelpful hint: Two of Australia's regions are called "South Australia" and "Northern Territory", and in France one is called "Centre". Didn't Australia give Jervis Bay back to New Zealand after the end of apartheid? My American boyfriend learnt all the states in school and has made an effort since then to memorise the constituent parts of other countries too. Growing up in the UK, I don't remember ever being taught the British counties, and I doubt I'd be able to name, let alone locate, even half of them. Very clever answers. I like all the Virginias but my favorite is Kite. I am impressed that they knew as many state names as they did, even though locations were off. 1. As a child, I had a wooden jigsaw puzzle of the United States, and could put it together blindfolded (although Colorado and Wyoming were often reversed). 2. Texas is another state where most people know what county they live in. Hey, I never said I didn't know what county I lived in. When I lived in New York City, I knew the counties (and boroughs) were New York (Manhattan), Bronx (the Bronx), Queens (Queens), Kings (Brooklyn) and Richmond (Staten Island). And yes, It's spelled "Dutchess", although it's named after Lady Anne Hyde (1637–1671), Duchess of York and wife of King James II of England. Texas has 254 counties, and they certainly did not attempt to get us to learn all of their names in school. I wonder if there is anyone who can name all of them. I've lived in both New Jersey and California and always knew what county I was living in, AND had a good idea of where the other counties were. I suspect that places where counties are unimportant are less common than otherwise. A friend of mine has memorized all the countries, their capitals, and their flags. So, I've done similar and found it useful. I can't imagine memorizing the counties/provinces/states of countries though, and I doubt I could accurately label the US states (though I could probably name all of them), despite having them drilled into me as a child. It's just not something that's generally useful unless you are traveling there (for instance I'm familiar with the Yorkshire area of England, because I have family there). Learning lists and connecting them with shapes. Child's play. Growing up in Idaho and Washington in the '80s, I had to memorize all the nations, all the US states, and the counties of two states. I can still do most nations except parts of Africa and Europe which have changed, all the states with no errors, and most of Idaho's counties, though it gets fuzzy in the south, no memory of Washington's beyond King and Pierce. I can pinpoint Perth and Sydney on a map of AU, but never knew their state names. There's a game called "Bomb the Crap out of Europe" where you have to choose targets by name, and score points for population killed. Variants for states, etc. are great for learning. @myl: "My score: a pitiful 72%"
Yeah, yeah, and I can only juggle a measly 7 balls. Showoff. I can find Kentucky! It's so easy. See, the bloke with the chef's hat? His head is Montana and his feet Mississippo. Well on his tray (West Virginia) is a pile of chicken–Kentucky! Do I get a prize? 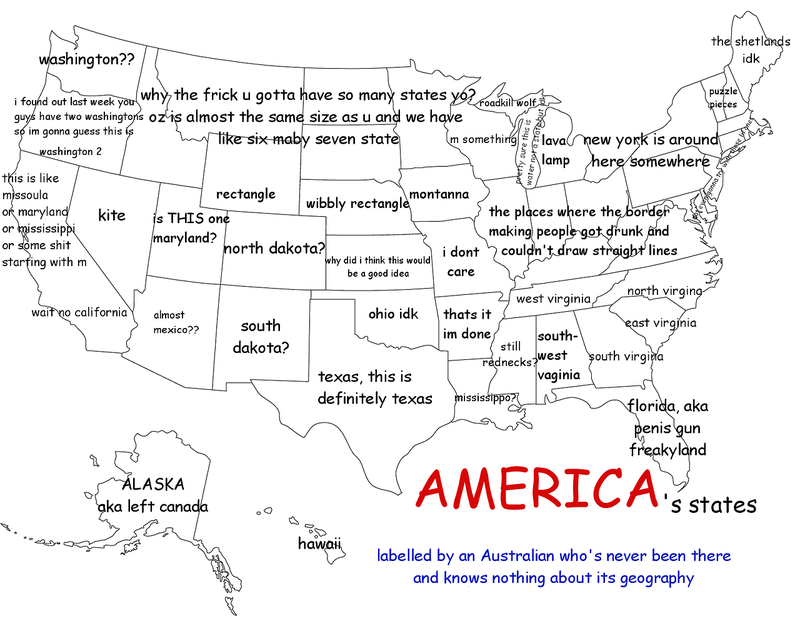 If anyone's interested in how much American geography is actually taught in Australian schools, well, I finished school in the mid '90s, and I think there was ONE American question on the final geography exam. 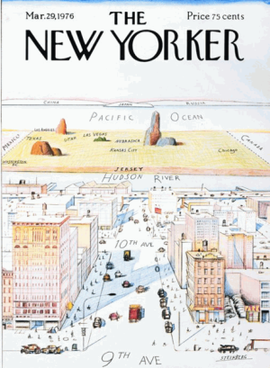 It involved choosing, among several illustrations, which is the accurate population density map of America. That's it. Back in seventh grade, we used reading comprehension exercises imported from America, which occasionally assumed knowledge of American states. We had to use an atlas. Do you mean his head is Minnesota/Iowa, his feet is Louisiana, and his tray is Tennessee? Because looking at it there, I can actually see that outline. Cute. Daryl Shpak, are you telling me there are inaccuracies in that map? I had an AI class in college (in the US) where the professor gave us the exercise of writing down as many states as we could in five minutes. About 3/40 of us could do it. One had been forced to memorize all the capitals once and was able to go down that list, and the other person and I were apparently the only ones to try visualizing a map. The purpose was to demonstrate that representation affects recall, which it succeeded at impressively. In any case, cognitively speaking, "name all the states" turns out to be a massively different activity than "label all the state on a map". I can name all the states, telling which ones touch which others. On the other hand, I think my sister can name them in alphabetical order. "No I can not tell you the name of who the president of Uzbecky Becky Stan Stan is. Can you?" I don't know, it seems like there might be a class of people for whom this sort of knowledge is foundational. Also, I've always wondered why Australia doesn't count its Antarctic Territory as a "territory" for the purpose of deciding how big Australia is, and how many territories it has. The Northern Territory counts. And Canada counts its three territories. So why not the Antarctic Territory? "Those people claim to have a vast knowledge of American culture but can't name any of the states." How many states do you need to know to have a thorough knowledge of American history and culture? 18 C: Mass, NY, Pa, and Va. 19 C: Add Ohio, Tex, Cal, Kansas. 20 C: throw in Fla for Miami and Disneyworld, Nev for gambling, Miss or Ala for civil rights, and DC for politics, and that's all you need. And everybody knows Alaska and Haw. We Americans need to know the states because our bizarre federal system means that vast unpopulated stretches of barren land have more power in our national government than some of the greatest cities in the world. So I know more about the upcoming senate race in Wyoming (pop lower than about a thousand suburban counties around the country) than I do about the recently concluded mayor's race in Los Angeles (more important in every possible way than Wyoming except that it doesn't get to have any senators). As an Australian, I'm pretty sure this spoof was put together by an American. "Why the frick you gotta have so many states, yo?" is definitely not idiomatic speech in Australia. Other commenters are right about Jervis Bay. Very few Australians are aware that we have a separate Commonwealth Territory located there administered directly from Canberra and subject to the same laws as the Australian Capital Territory. Josh Treleaven: perhaps they're tacitly acknowledging that international law doesn't recognize territorial claims on Antarctica. -France , got an abysmal three if you count lower Normandy as Normandy 1)what kind if country has a place in the middle called Centre?. 2) After all that modern European history reading about Alsace- Lorraine…. In college in the 1970s our 20th Century European history prof,an Austrian, wasted big chunks of time at the start of the semester insisting we memorized the names of parts of Yugoslavia- wanting to get to WWI and the Russian Revoultion we cried out in protest- what possible relevance could names like Serbia, Croatia,or,God help us, Bosnia-Herzogovina possibly have? I'm astonished that nobody else has made this point yet (tho half of it has been made, that such information is more or less useless as such). I'm a child of the 70s, a teen of the 80s, and somewhere in my "educational journey" someone made a point that I've always remembered, that was certainly true back then when the lookup media was books of some size that as a result generally stayed in one place, one's home, office or the library, but is *DEFINITELY* much truer today, when the lookup point is google or wikipedia on the net, the access to which even most kids seem to carry around in their pocket these days. The point went something like this. The point of an education is not to teach one all there is to know about everything, as that's simply impossible. Rather, the point is to first teach one the basics such as how to read and write in ordered to communicate, basic math and logic so as to have some idea whether a particular fact of interest is even remotely in the ballpark of reality and so as to properly construct one's queries, and enough very basic facts about the world around you again so as to have some idea whether what you're looking at is reality or fiction. Beyond that, it's generally narrowing and deepening specialization into and throughout adulthood. Even in the 70s, no need to be able to name all the states or label them on a map, when just being able to pick out the states from the non-states on a list and knowing how to look them up is enough. Of course that's much more true today. Google and wikipedia are often a pocket away even for kids, and if people need to look up a state or pretty much anything else, they do it. I too had a puzzle of the US states growing up. While I can still remember the general area of most states, I can't do much more. But that's all I /need/ to remember. I could certainly pick out the states from the non-states in a multiple choice or matching test but I couldn't cold-list them all or label many of them on a map. But I don't /need/ to. One year we were drilled on a list of the then-current nations and their capitals. But while I can still say Afghanistan/Kabul (tho I needed spell-check help on Afghanistan), USSR/Moscow isn't useful except in a historic context these days. And Uzbekistan or Kazakhstan, other than knowing they were parts of the USSR and thus having some hint where to find them on a map, I've little clue, and NO clue what their capitals might be. But I can look it up! I have a spell-checker to flag "Afganistan", and I know at least enough to get the spell-checker or google "did you mean" to give me the corrected alternative, and that's all I NEED to know about them where I live and at my level of specialization in them. "It's not the ignorance – you're right there is no point in knowing the US states if you are a European – it's the hypocrisy. Those people claim to have a vast knowledge of American culture but can't name any of the states." Your claim is certainly hyperbole – as if there were people with access to televisions who couldn't name California or New York – but, more importantly, is superfluous to your own argument. What exactly does geographic knowledge have to do with an appreciation of jazz, to use your example? I learn these sort of things – countries and capitals – because I find it fun to actually know things, but for the most part it's still trivia. And why is it necessary to point out and condemn the supposed hypocrisy in Europeans not knowing US geography, but it's perfectly cool and acceptable for Americans to call the French, for example, "cheese-eating surrender monkeys"? that line is from the simpsons, which is probably incredibly popular in france as it is in spain. as you know it's acceptable (more importantly it's funny) because of historical french opposition to US military action unless they need it personally. obviously since americans are stereotyped as uniquely ignorant of geography/history/language of other countries it is reasonable to point out the hypocrisy of people who, while they can no doubt name california, miami, NY and DC they often cant place these global capitals on the right coast, which is much more embarrassing. On the map of France, I got Bretagne, Basse-Normandie, Haute-Normandie, Nord-Pas-de-Calais, & Picardie with certainty. I guessed a few others. But I lived in Picardie for a year. The exercise reminds me of the amusing vraies cartes de la france page. Oh, and Ile-de-France, of course. 1) An American probably wouldn't have known that there are 6 or 7 states in Australia. 2) Such idiomatic language is common on 4chan, regardless of the users nation of origin. @Jeremy I saw it originally on Tumblr, I think it may have originated there – but the same applies there too. I scored 98% on the French regions test, but I think it was luck. The trouble with the regions is that some of them share names with historical provinces, but their borders are different. For example, Nantes historically belongs to Brittany (it was one of its two capitals), but now it's the capital of Pays de la Loire. Also, a big part of historical Languedoc (including Toulouse, its capital) is now in Midi-Pyrénées, not Languedoc-Roussillon. Confusing, n'est-ce pas? Everyone's forgotten about the Hutt River Principality. Also, not sure if the person talking about apartheid was being sarcastic or not. In case not, that was Walvis Bay, not Jervis. MikeN: Thanks for Proclaiming your ability to pronounce "Saskatchewan". I got 72% on the French map, which would be pretty impressive for an American, except that I took French classes for two years in a room with just such a map on the wall, suitable for students to stare at while their attention wandered. Re Duncan's point — It's certainly true that there is a balance between facts to be memorized and facts to be stored offline. But "I don't need to know X because I could just look it up" is not a practical rule of thumb. Almost any fact, taken in isolation, will fail that test, but you can't actually think about something if you have to look up every fact you're using to draw conclusions. If all you know about Oregon is that it's a US state, then learning that something is in Washington, or someone is from Oregon, tells you almost nothing. If you actually know things about Oregon, then you can start to draw inferences. Figuring out how much you need to know is an art. There is no magic answer. But knowing (basically) where things are on a map without having to look it up is something that has value. There are actually 10 territories governed by Australia. 2 mainland, ACT and Northern Territory, 1 offshore, Norfolk Island. The other seven are goeverned only by commonwealth law usually through an appointed administrator. Territory of Heard Island and McDonald Islands. The last is Hutt River Province, an independant sovereign state, that although achieved legal status in 1972, is not recognised by Australia and other nations. > someone is from Oregon, tells you almost nothing. > can start to draw inferences. Yes, but if all you know that Washington/Oregon is that they are states, then you've very likely had no previous /reason/ to learn more about them. People generally learn what they have an interest in, and without that interest, there was no reason to lear. Once you learn something is in Washington or someone is from Oregon, now there's a reason to look it up, and if you're like most people, you're far more likely to actually remember it than if you has simply looked it up or come across it without that association. I learned the states, their capitols, and their locations from playing Zip Zap Map as a kid. Now I just visit Sporcle if I want to test my knowledge of geography. @TJL: It's a pretty radical straw man to claim anyone here thinks insults against the French are "cool and acceptable". The people who do that seriously are probably the same ones who themselves couldn't name or locate most US states. And there are definitely tons of people like that. The mistake some Europeans make is assuming that's equally true of the Americans who are traveling in other countries. If I can draw a freehand labeled map of Europe and you can't name more than 10% of the US states, then I'm not the one who's ignorant of geography. 1)what kind if country has a place in the middle called Centre?. This reminded me that once in the last few years I saw 'Middle Kingdom' updated to 'Central Country'. ca_sh: Norfolk Island a Territory? I thought it was part of New South Wales. I got all the Australian ones, but it took me a while to remember Queensland. I definitely couldn't name all the French regions, let alone the départements. I found the joke map reassuring just because the usual stereotype is that Americans are the only people who are ignorant of other countries' geography. Administrative division in the US has a lot of variation. In New England, the land is entirely divided up into cities and towns, and counties are almost a vestigial division of government, mostly administering the court and prison systems. In some places county government doesn't even exist. In Virginia, incorporated cities are disjoint from counties, and county government has a similar role to city government outside of a city, so counties become much more important. …As for US anti-French sentiment, I think there was a peak in that around the time of the Iraq invasion but it's died down now. "Cheese-eating surrender monkeys" was a line from The Simpsons spoken by a character who was (ironically, I suppose) actually an exaggerated, jokey stereotype of a Scotsman, and who was clearly supposed to be ignorant. But it got shorn of context pretty quickly. Americans are sensitive because our supposed geographical ignorance is constantly held up by Europeans to demonstrate their supposed sophistication. I was recently at a conference in London where at least two British speakers thought it was funny to snide remarks about American geographic ignorance to an audience consisting of 99% Europeans. Since I live in Austria and deal on a regular basis with well-educated Austrians who think the Polish border is an 8 hour drive from Vienna or don't know what country Ostrava is in, like a lot of American expats I find these jokes pretty tiresome. Since the map is clearly meant as much as a joke as the famous New Yorker cover of America, what nationals of Australia or any other country know about American geography seems sort of irrelevant. I never cared a bit about state capitals or counties. I always have known which county I lived in, though, and (thanks to weather alerts) some of the neighboring counties, and I know the county of the major American cities. On the other hand, thanks to a song called "Fifty Nifty United States," which I had to learn in school, I can recite all fifty states in alphabetical order (with the tune running in my head), which was an extremely helpful skill back in Trivial Pursuit days. Jervis Bay, along with the external territories of Australia (as listed above and including the Australian Antarctic Territory) is non-self-governing, so it is (and they are) not really in the same category as the Northern Territory and the Australian Capital Territory. Jervis Bay comes under the jurisdiction of the ACT and the residents vote in one of the electoral districts of the ACT so it is often considered an exclave of the ACT but in fact legislation sets it up separately. In short, there is a perfectly justifiable reason for leaving the political map of Australia as six states and two territories. @ Martin B: This may be off topic, but the Territory governance arrangements are not quite as you describe – they are a little more complex. Jervis Bay is a separate and distinct Territory from the ACT. The JBT is not subject to ACT jurisdiction as such, although the Cth contracts with the ACT to provide some services there (e.g. Police). Instead of legislating State level laws for the JBT, the Commonwealth simply adopts and applies most ACT laws in the JBT as federal laws. So the ACT laws are kind of "borrowed" and used in the JBT as its laws too. JBT residents vote as part of the same electorates as ACT residents for the Commonwealth Parliament only. Not being part of the ACT, they do not vote for the ACT Parliament. Similar arrangements apply to Christmas Island and Cocos (Keeling) Islands, except there the Cth borrows and applies Western Australian law. They have self-government at local government level only, as if they were WA "shires". For federal elections, their residents vote in Northern Territory electorates (not actually being part of WA, they can't vote in that State). Incidentally, C(K)I voted in a UN supervised referendum in 1984 to become part of Australia. In the case of Norfolk Island, the High Court decided in 1976 (Berwick Ltd v Gray) that it is a part of the Commonwealth (i.e. like the NT and ACT). NI is self-governing with its own Assembly with similar powers to the NT and ACT Parliaments. And NI is exempt from some federal laws (like health insurance) and taxes. NI is not part of a federal electorate, although Australians there can vote in their "home" electorates on the mainland. So, as I understand it (and happy to be corrected), the "Commonwealth of Australia" consists of six States and six Territories (ACT, NT, JBT, NI, C(K)I and CI). The other external Territories (like the Heard and McDonald Islands Territory) are possessions of the Cth. while not being intrinsic elements of it. But no one lives there. It makes the American system look simple.